In many older cities, stormwater and indoor sewage are combined into a single network of drain pipes referred to as Combined Sewer Overflow (CSO) systems. Although these systems are adequate during low rainfall events, the CSO systems are unable to adequately treat much of the wastewater during heavy rainstorms. As a result, large volumes of untreated wastewater enter local rivers and lakes. To reduce these issues, the cities are either required to update their entire grey infrastructure system or look at ways to reduce stormwater runoff across the city through the implementation of LID “green” infrastructure practices like PICP. In West Union, Iowa, they compared the life cycle cost of a permeable paver system in the downtown area with those of traditional pavement systems. 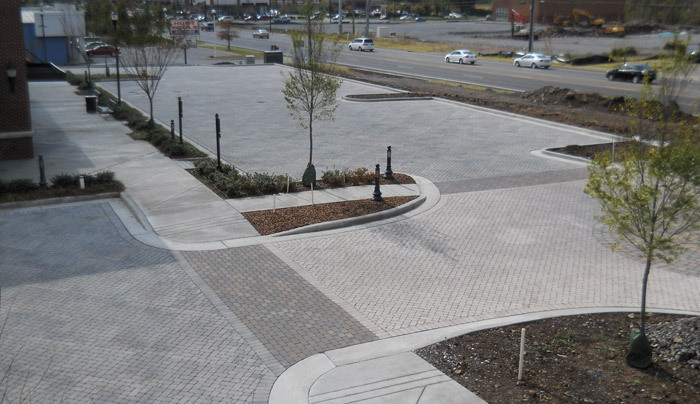 Results showed that although permeable pavement will initially be more expensive, the lower maintenance and repair costs will result in cost savings in the long run. The city would begin to realize these cost savings by year 15 of the project. Estimated cumulative savings over a 57 year period were calculated to about $2.5 million. Additional benefits beyond reduced flooding included (1) enhancement of the groundwater supplies; (2) improved water quality in an impaired lake downstream from the development; (3) enhanced recreational amenities at the lake; (4) improved pavement surface temperatures; and (5) improved street appearance. Analysis (BCA) comparison of green versus grey infrastructure to evaluate the best approach for investing the city’s funds to solve the CSO problem in a dense urban environment. The analysis demonstrated that for equal investment amounts and similar overflow volume reductions, the use of LID/GI and environmentally conscious infrastructure practices would provide 20 times the benefits of traditional stormwater infrastructure such as large tunnels and pumping stations. Source: Greenworks Philadelphia "Philadelphia Combined Sewer Overflow Long Term Control Plan Update, Supplementary Documentation, Volume 2 - Triple Bottom Line Analysis". October 2009. The City of New York for example determined that the operation and maintenance of the Green Strategy was $200,000 less annually than their Grey Strategy. Over a 20-year period, the Green Strategy will reduce CSO volumes by nearly 2 billion gallons more than was possible by the Grey Strategy. In total, the Green Strategy would cost $5.3 billion, which is $1.5 billion less than the $6.8 billion for the Grey Strategy. Plus the Green Strategy provides additional valuable benefits not provided by the Grey Strategy, including improved neighborhood aesthetics, lower summer temperatures, reduced energy use, cleaner air and water, and increased property values. Source: US EPA "Maintenance of Low Impact Development: Communities are Easily Managing LID Practices" December 2012.